BRUSSELS — The United States won’t abandon its pursuit of peace in Syria after suspending direct U.S.-Russian talks on a cease-fire, U.S. Secretary of State John Kerry said Tuesday, even as he announced no new strategy to replace diplomatic efforts with Russia. Washington and Moscow will still discuss Syria as part of larger multilateral negotiations, Kerry said, and they’ll make sure their warplanes conducting bombing missions in the Arab country don’t cross paths. Explaining Monday’s announcement to halt bilateral contacts over Syria, he said Russia has rejected diplomacy and chosen instead to help Syrian President Bashar Assad’s government achieve a military victory over rebel groups. “We acknowledge in sorrow and, I have to tell you, a great sense of outrage that Russia has turned a blind eye to Assad’s deplorable use of these weapons of war, chlorine gas and barrel bombs, against his people,” Kerry said in a speech focused on trans-Atlantic ties at an event hosted by the German Marshall Fund in Brussels. Monday’s announcement dealt peace efforts a serious blow. Coupled with a Russian announcement to put on hold a plutonium disposal deal with the U.S., it showed chilly relations between the former Cold War foes turning even frostier. Kerry said the decision wasn’t taken lightly. “We are not giving up on the Syrian people. We are not abandoning the pursuit of peace,” the secretary of state said, with Washington maintaining its pursuit of a truce that grounds Russian and Syrian planes and allows aid to reach besieged, rebel-held areas of northern Syria. The U.S. also will press on with military efforts against the Islamic State group, he said, and finding a durable political solution that allows Syrians to return home and alleviates Europe’s refugee crisis. The 5½-year war has killed as many as 500,000 people, chased millions of Syrians from their homes and allowed IS to carve out territory for itself and emerge as a global terror threat. The Obama administration had been working with Russia for months to forge a cease-fire that ended Assad’s attacks on rebel and civilian areas and separated U.S.-supported, “moderate” groups from fighters linked to al-Qaida. Neither side proved able to fulfill its side of the bargain. But Washington has few other options, given President Barack Obama’s opposition to using military force against Assad’s military. The White House and State Department said Monday there was no point to the bilateral discussions any longer because Russia hasn’t lived up to a Sept. 9 agreement that included a demand for unfettered humanitarian aid to places like Aleppo, which has been under Russian and Syrian bombardment. They pointed to Russian attacks on hospitals and on an aid convoy last month; Russia and Syria deny they were responsible for the deadly Sept. 19 strike on the convoy. “Of course I hope that there is not going to be a new Cold War,” Vitaly Churkin, Moscow’s U.N. ambassador, said late Monday. 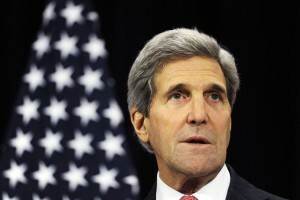 He said U.S.-Russian differences have been “overdramatized” and voiced hope that cooperation on Syria could be resumed. The U.S. hasn’t ruled out restating talks with Russia, if it takes significant action to halt the bloodshed in Syria. “Russia knows exactly what it needs to do,” Kerry said in his speech. Russia intervened on behalf of its close ally Syria a year ago, joining Assad’s bombardment of both anti-Assad rebel groups and militant groups such as the Islamic State and Fatah al-Sham Front, an al-Qaida spinoff formerly known as the Nusra Front. Russia is interested in propping up Assad in part because Russia’s only naval facility outside the former Soviet Union is on the Syrian coast. If it had been implemented, the cease-fire deal would have created a joint U.S.-Russian center to coordinate military and intelligence operations. President Barack Obama had overruled Pentagon objections to such cooperation and Kerry made the offer. In Moscow, the Russian Foreign Ministry expressed “deep disappointment” about the U.S. move and blamed the diplomatic impasse on Washington’s failure to separate rebels from terrorist groups. “We are under a growing impression that in its striving for a much-desired change of power in Damascus, Washington is ready to ‘make a deal with the devil’ and forge a union with terrorists who want to turn history backwards and enforce their inhuman norms by force,” it said in a statement. Matthew Lee reported from Washington.